PSTN: What Is It, and How Does It Work? What Is a Penetration/Vulnerability Test? 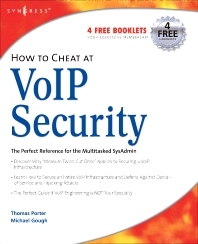 This is the perfect guide if VoIP engineering is not your specialty. It is the perfect introduction to VoIP security, covering exploit tools and how they can be used against VoIP (Voice over IP) systems. It gives the basics of attack methodologies used against the SIP and H.323 protocols as well as VoIP network infrastructure. IP telephony uses the Internet architecture, similar to any other data application. However, from a security administrator’s point of view, VoIP is different. Understand why. What Functionality Is Gained, Degraded, or Enhanced on a VoIP Network? Find out the issues associated with quality of service, emergency 911 service, and the major benefits of VoIP. Learn about the types of security attacks you need to protect against within your voice messaging system. Understand what PSTN is and what it does as well as the H.323 protocol specification, and SIP Functions and features. Learn the services, features, and security implications of DNS, TFTP, HTTP, SNMP, DHCP, RSVP, SDP, and SKINNY. Learn about Denial-of-Service attacks, VoIP service disruption, call hijacking and interception, H.323-specific attacks, and SIP-specific attacks. Learn the methods of verifying both the user identity and the device identity in order to secure a VoIP network. Skype does not log a history like other VoIP solutions; understand the implications of conducting business over a Skype connection. Use a sample VoIP Security Policy to understand the components of a complete policy. Thomas Porter, Ph.D. (CISSP, CCNP, CCDA, CCSE/SA, ACE, IAM) served as the first Chief Information Security Officer (CISO) at Avaya, and is currently the Lead Security Architect for Business Communication Consulting and Director of IT Security for the FIFA 2006 World Cup in Germany He is a past member of the IP Security Protocol Working Group, and the Executive Telecommunications Board of the State University of New York. He is currently a member of the IEEE, and OASIS (Organization for the Advancement of Structured Information Standards). Michael Gough is host and webmaster of www.SkypeTips.com, which was launched in January 2005 and receives more than 100,000 hits per month, and www.VideoCallTips.com, which receives more than 30,000 hits per month. Michael writes articles on Skype and related issues. He also explains Skype’s options and instructions to users so that they can practically apply Skype at home and in the workplace. Michael also evaluates products used with Skype and provides feedback to the vendors on features and improvements to help drive the direction of Skype-related products. Michael is also the host and webmaster for www.VideoCallTips.com, a Web site focused on helping people understand how to make video calls to family and friends, and maintains ratings of the many video call solutions available. Michael’s full-time employment is as a computer security consultant with 18 years’ experience in the computer technology field. Michael works for a Fortune 500 company, where he delivers security consulting services to their clients. Michael also presents for his company at many trade shows and conferences and works with associations and groups, advising agencies like the FBI on Skype security and the Center for Internet Security on wireless security.